Discussion in 'News & Announcements' started by ItsAZZA, Dec 19, 2016. Yes, all of you get a free polar bear pet when you join the server! This great great festive friend can win you a $30 coupon to our server store. We are going to draw multiple of these... therefore there will be multiple winners! How awesome is that!? You can enter until Sunday 25th 10PM GMT (5PM EST). There might also be other prizes, which will be released later on so stay tuned! Join our server and you'll automatically get the permission to use this pet. 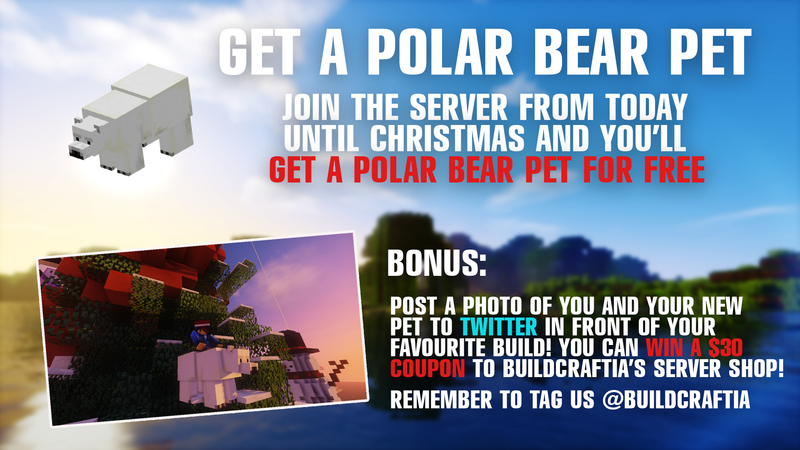 Then, take a photo and submit it (you and your polar bear in front of your favourite build) on Twitter. Remember to tag @BuildCraftia, otherwise we won't count your photo. Winner(s) will be drawn on Monday 26th and they will be contacted through Twitter, so take a close look at your Twitter feed! You can give your coupon code to someone else, if you do not need it yourself. Coupon must be used at one time, excess won't be saved for later. The prizes are given manually, so getting them may take some time. Should you have any questions, please do not hesitate to ask. And as always, Happy Holidays, and have an awesome week at BuildCraftia. Christmas post from us is coming closer to Christmas Eve. Mipsu, Alkaline and Dusty lick this.